When I was a child, at every one of my birthdays, a few wonderful things happened. I would get a raise in my allowance, my lights-out time at night would be pushed back by 15 minutes and I would be allowed to choose my favorite meal. My parents were extremely frugal people even back then, and hell-bent on making sure that I wouldn't be stuck with the 'spoiled single child' label. Therefore, there were not many presents. Usually a book or two and a little something else. I remember a really cool piggie bank one time, in the shape of a picture frame. My parents were amazing cooks, each in their own way. My mother cooked foods that reflected her German heritage. My father cooked Indian food like a god. I speak in the past tense because with age and dietary restrictions their cooking has changed a lot. My mother reads cookbooks with a passion, but save for baking recipes almost never followes a recipe. To her they are merely references. Papa, on the other hand cooks many of his recipes by following his cook books to the 't', even though he has cooked the same dish many dozens of times. 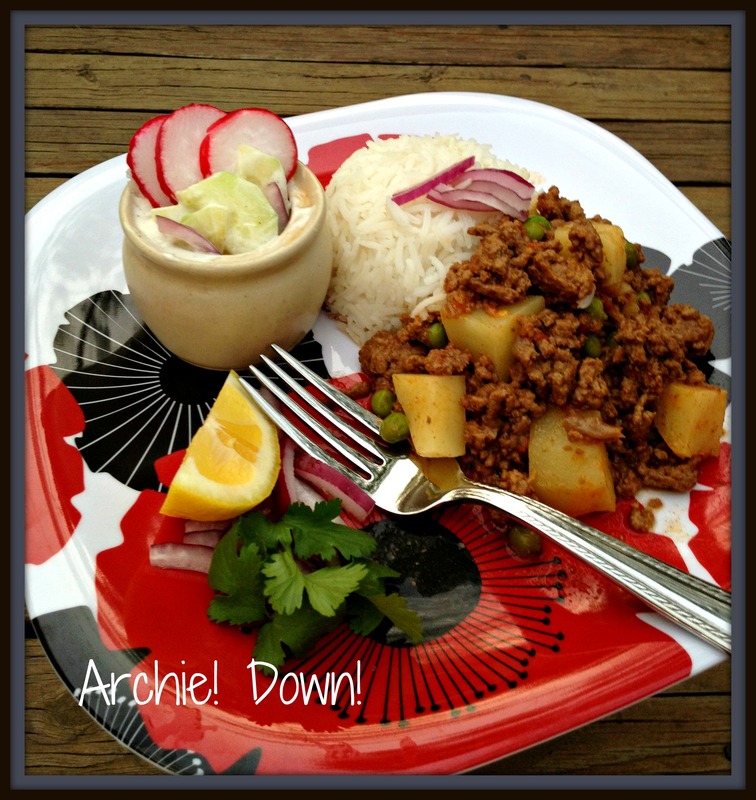 One of my favorite dishes, and now my children's as well, was Kheema. Kheema is a dish with ground meat as the main ingredient. It is originally one of the many Persian dishes imported by invading Mughals. Kheema, in our home, is made usually of beef. Ground lamb is a tad too expensive here in the US, and I only like mutton in certain curries. Served over a bed of piping hot rice, and accompanied by a cooling bowl of raita (a cucumber-yogurt salad), Kheema was a dish I often asked for as a special birthday meal. The savory meat, the satisfying bits of seasoned potatoes and the little green, jewel-like sweetpeas, are to this day, a meal I can't ever pass up. My husband likes meals in which the flavors of the ingredients aren't overwhelmed by spices. If you like very spciy Indian food I would recommend doubling the spices marked with an asterisk (*). You can lower the amount of fat in this recipe by browning the meat separately in a pan and draining the fat. If you are using a lean ground meat you can choose to skip this step. Let us assume that we are skipping that step and go from there. Heat the oil in a karhai or a heavy, flat bottomed pan. A wide and shallow wok will also work if you have it. When the oil is hot, lower heat to medium, add the onions, bay-leaf, cinnamon, and red dried red peppers. Saute until the onions are starting to brown. Now add the garlic and ginger, cardamom, and clove, and continue to saute until the onion is a pleasing brown color. Add the teaspoon of sugar, coriander, cumin, and turmeric, and saute a little longer, giving the sugar the chance to caramelize. During the sauteing process you may need to add a tablespoon of water now and then to prevent burning. This initial stage of cooking should not be hurried as it creates the base for the sauce. Once the onions have caramelized and softened they will eventually dissolve rather than maintain their shape. Add the chopped tomatoes and tomato paste and on medium-low to medium temperature allow the ingredients to form into a fragrant sauce. Again, you may need to add a half cup of water here or there to make sure it doesn't dry out. When the sauce has formed, reduce the heat, remove about a quarter cup of the sauce and stir into the room temperature yogurt. By tempering the yogurt you will avoid curdling when you add the yogurt mixture to the sauce. Stir the yogurt mixture back into the sauce and stir to combine. Add the meat and cook the meat until it looses it's pink color. When the meat is no longer pink you can add a cup of water and simmer on medium low heat for half an hour. The flavor improves the slower you cook it. Add the cut potatoes and raise the temperature to medium. If needed add water. When the potatoes are done add the frozen peas and cook for another 3 minutes or so and then turn off the heat. Let the Kheema rest for 10 minutes before serving. Serve with hot rice and a side of Raita. We like a squirt of lemon added to the Kheema when served.